Bracelets are big this season. Wearing multiple bracelets at once is even better. This class places a focus on professional stringing and design techniques. You will make two bracelets using two different stringing materials. One bracelet will be made strung on nylon using glass beads from the Czech Republic and sterling silver beads. The second bracelet will be strung on flexible wire. 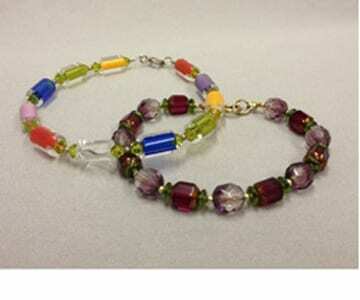 You will learn how to use crimp beads to finish this bracelet. Both bracelets will be secure and beautiful. No previous experience is necessary. Registration is through Kirkwood Community College. Register at: www.kirkwood.edu and go to Continuing Education and then search for Beadology Iowa under the instructor search. On site registrations will be taken if registration through Kirkwood meets minimum requirements of two participants. Instructor: Cheryl Weatherford.